Flashback to 2011, the day before the Oregon-Auburn National Championship in Glendale, Arizona for a moment. At this Duck pep rally 24 hours before the game there’s some guy from Alabama wearing a sign stating that he came all the way from Alabama to root against Auburn. Do you think there were any Beaver fans doing that at the Auburn pep rally? Nope. I’m all Oregon when the Ducks are playing the Beavs, or if a Beaver win in another game may keep the Ducks from winning a Pac-12 North title. But this baseball thing is different. 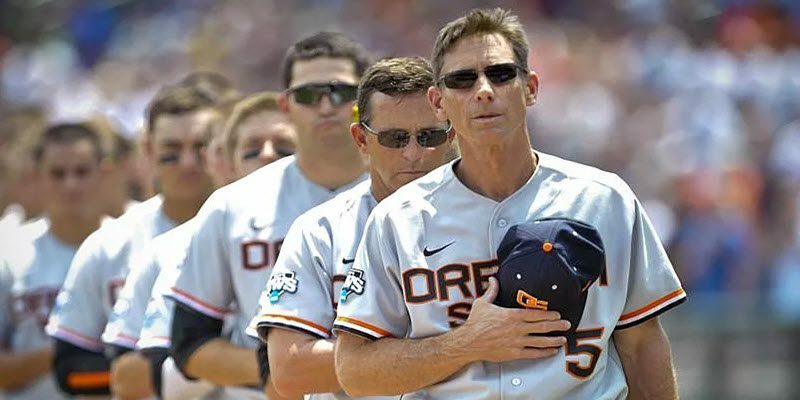 There’s only one college team from the state of Oregon playing at TD Ameritrade Stadium in Omaha, and that’s Pat Casey’s crew. They have earned the respect and allegiance of Oregonians. If you’re rooting for Oregon State to lose, please move to California, . . . immediately. Oregon doesn’t need you. 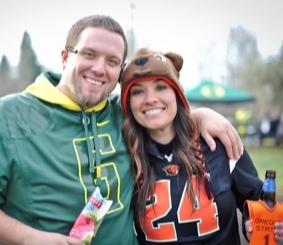 There’s an educated breed of Beaver and Duck fan that gets the Civil War. We remember the days when Oregon would be playing a home football game and when the Beaver halftime score was announced the crowd would cheer if Oregon State was winning. The same thing happened at Parker stadium, cheers for the Ducks when the OSU public address announcer let fans know that Oregon was ahead. Those fans in the 70s and 80s? They got it. Back then it was us, the state of Oregon, against the rest of the Pac-8, then the Pac-10, then … then … things change. All of a sudden both teams got good and the 1983 Toilet Bowl became a distant memory. We actually won more games than we lost. Oregon State thumped Notre Dame in the 2000 Fiesta Bowl, and shortly after that the Ducks became the dominant football team in the Pac-12 for a decade. Recruiting battles for top in-state talent are more fierce that ever, but for a few days, it’s time to lay down arms. It’s time to pull for a team that plays baseball the right way. I doubt there are many people under 40 who agree with this article. There are some Beaver fans who wouldn’t ever want a Duck celebrating a Beaver win. You too, need to move to California; the state of Oregon is too good for you. You are like Ndamukong Suh. He was born in Portland, graduated from Grant High School and left the state for to play college football elsewhere. Just think of the difference he could have made along the defensive line for those two 10-3 Duck football teams in 2008 and 2009. Richard Washington from Benson Tech, Kevin Love from Lake Oswego and Danny Ainge of North Eugene — they didn’t get it. Rooting for the Beavers at the College World Series may be harder for you than for Dee Andros to skip dessert. 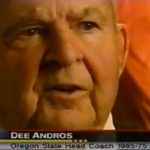 If you ever met him, Dee was a bright man and this next quote isn’t directed at the Great Pumpkin, but rather toward those Oregon fans who relish in pulling against Oregon State. If you’ve never done it, it’s time to support Beaver Nation. A team from the great state of Oregon is this close to greatness. Three national championships in 12 years would put Oregon State in rare air. What’s to like about this Beaver team? They reflect the integrity of a noble coach and embody the work ethic of a proud, blue collar community. They’re feisty and gutty, and have played their best ball with the game on the line. If there’s a poster child for this club it’s Nick Madrigal, all 5-feet 7 or 8 inches of him. He’s smart, he’s tough and he’s clutch … kinda reminds me of another 5-7 or 5-8 guy who used to lace ’em up for the Kamikaze kids. Do you remember Mike Drummond? (1974-78 Oregon basketball) There were plenty who could run faster and jump higher, but no one gave you more than Drummond. Need someone to get the ball to the right guy at the right time? Drummond’s your guy. Need someone to drill both ends of a 1-and-1 late in the second half? Drummond’s your guy. Need someone to take a charge? Look no further than No. 10. Madrigal is cut from the same cloth, it’s just that this cloth is orange and black. I’m not saying become a Beaver fan. I am saying respect Beaver nation, support Beaver nation. You’re in good company. There’s a lot of mixed blood out there. Current Duck Co-Defensive Coordinator and recruiting stud Keith Heyward played his college ball where? OSU. 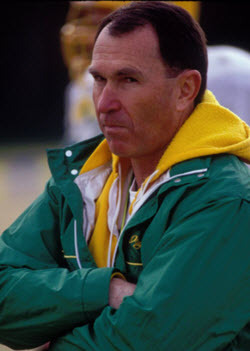 Heck, our football field is named after a former Oregon State player and assistant coach … Rich Brooks. Amen. Oregon State doesn’t need your support, but they have earned it. (All fans–please take note of our Commenting Rules as there will be no insulting, no name calling, no belittling or even back-handed compliments. If so, then your comment will be deleted immediately and your IP Address blacklisted if it is especially objectionable or happens more than once.